A new major version of Plesk has been released and we were one of the first hosting providers offering it to our clients. It’s Plesk 12.5 we’re talking about and this release marks major improvements to PHP support amongst other important updates. 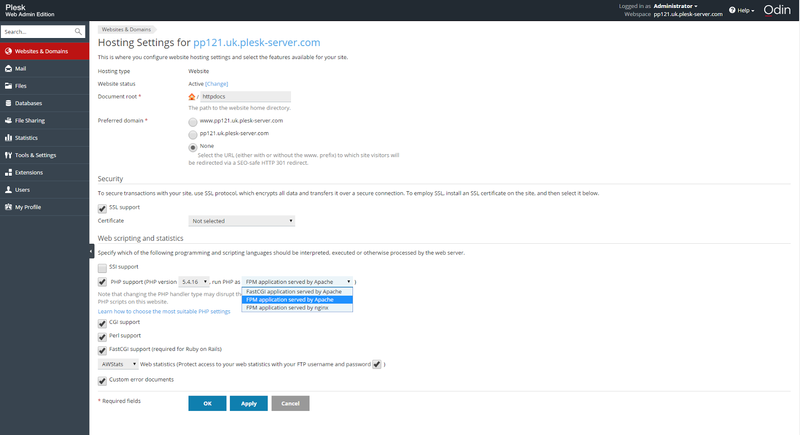 All of our new Cloud VPS hosting plans come with Plesk 12.5 and we are excited to bring you this more amazing improvements as they appear. 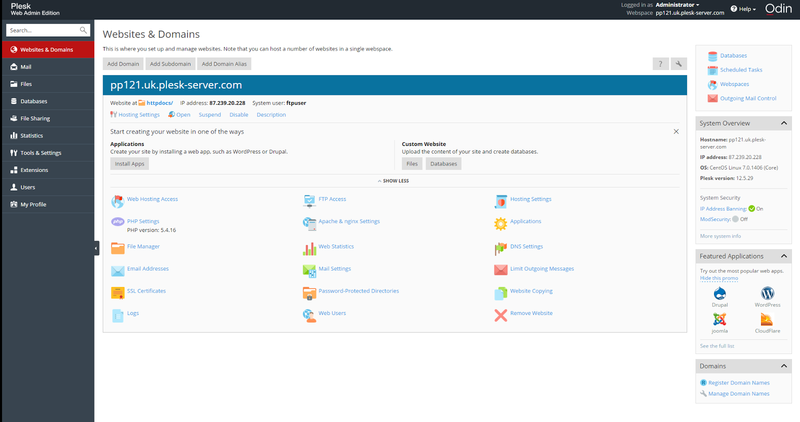 What’s changed in the new Plesk 12.5 control panel? PHP-FPM with Apache 2.4 is now available for use, which is especially great news for websites with lots of traffic. It supports any PHP version, and you can use it on a per site basis – we recommend using PHP-FPM under Apache 2.4. Cache module support: now you can make your sites significantly faster by enabling cache module from your PHP settings. By using Zend OPcache, you can reduce the mean response time of your website with a Drupal application by 14%. This is activated by default for PHP 5.5 and 5.6, but if you’d like to enable the cache module for older PHP versions, all you need to do is contact our support team. Composer PHP dependency manager was added – so users can now install and update their dependencies via the UI. Now you can upload and download MySQL database dumps via the UI (before it was done using phpMyAdmin), so you can work easier and faster at the same time. You can check the integrity of your database table thanks to a new mechanism implemented by the Odin developers so you can quickly notice if there are some issues and fix them on the spot. You can move databases between subscriptions – this feature was implemented aiming to increase the flexibility of your work. You can enable direct access to phpMyAdmin so there is no need to give your developer access to the Plesk control panel. The subscription’s General tab has been replaced with the “Account” widget in the right column, so an administrator can now customize the subscription or change the service plan more easily. Mail improvements – you can now specify the date when the auto-reply mail switches off – this is a functionality that was frequently asked for by our users and it has been now added to Plesk 12.5. Support for Ruby was added (mod_passenger) to Nginx webservers. Cron job scheduling was simplified and enhanced so now it’s much easier to set up and manage tasks. You will also be able to set different notification configurations per task, so you can notify the appropriate people automatically. You can now check the logs in real time so you can troubleshoot issues with your application faster. This new Log Browser saves you the hassle of manually searching through error messages and warnings, as you have the option to search the logs by message/code/IP. You can see a complete list of the new features available in Plesk 12.5 here. For any questions or suggestions we’re at your service – you can reach our Support team 24/7 here and our friendly Sales team during UK business hours at sales@layershift.com. If you’re an existing client and you want to upgrade your Plesk panel contact us and we can add you to the upgrade queue or wait a little while and we will schedule you in automatically. We’re also curious about your feedback, so you’re welcome to share your thoughts on Twitter or Google + also.